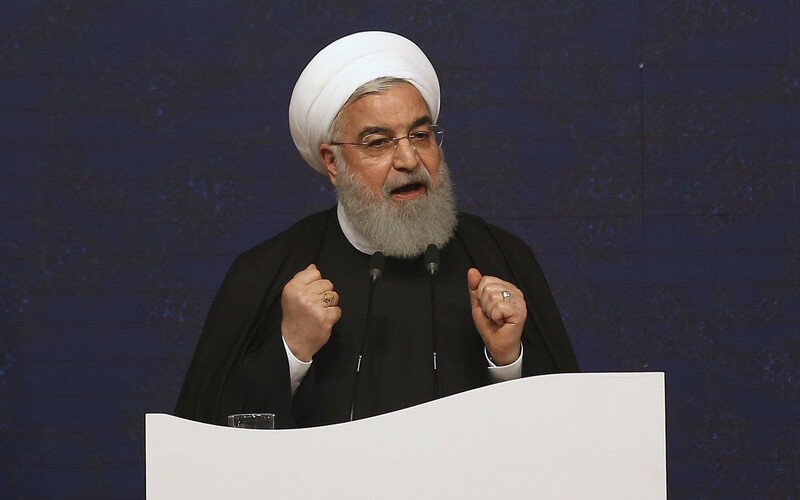 TEHRAN, Iran — Tehran is preparing a lawsuit in Iran against US individuals involved with economic sanctions imposed by Washington, President Hassan Rouhani said Monday. The case would be lodged in a “competent court inside Iran,” he said, quoted by state television. Speaking after the last cabinet meeting of Iran’s calendar year which ends on March 20, Rouhani condemned the sanctions as a “crime against humanity” that was hitting ordinary Iranians. “The world should know that what America has done was not against the Iranian state, it was not against Iran’s nuclear program, it was against the well being of the Iranian people,” he said. The renewal of American sanctions, which had been eased in exchange for curbs on Tehran’s nuclear program, sent shockwaves through Iran’s economy. The sanctions have indirectly impacted medical and food supplies and a steep decline in the value of the rial has pushed up prices of basic goods. In October, the International Court of Justice (ICJ) ordered the United States to lift sanctions affecting imports of “humanitarian” goods to Iran. TEHRAN, Iran — Iran’s president urged Iranians Monday to put a curse on the United States, Israel and Saudi Arabia — blaming the US and its allies for his country’s ailing economy. 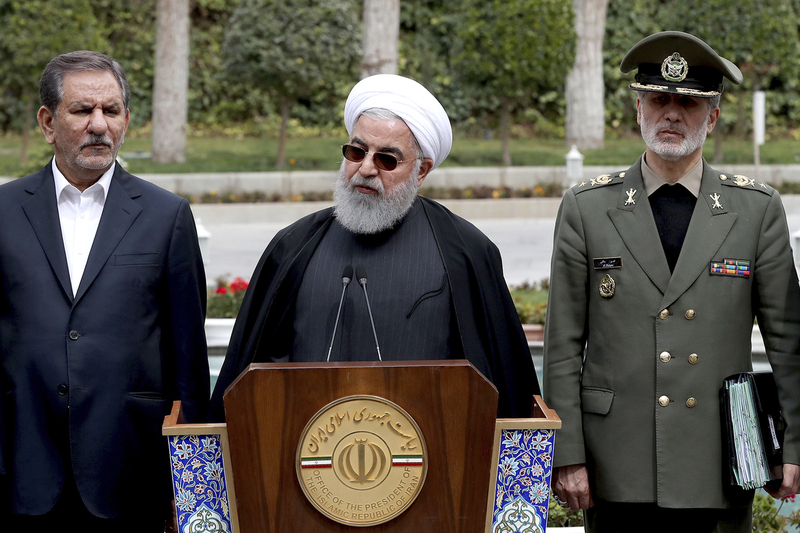 Monday’s televised remarks by Hassan Rouhani were meant to deflect criticism of his administration’s performance amid a spiraling economy after the Trump administration pulled out of the nuclear deal and re-imposed sanctions on Tehran last year, targeting Iran’s vital oil sector. Rouhani urged Iranians to “put all your curses on those who created the current situation” and added that “the United States, the Zionists” and Saudi Arabia were to blame. The economic crisis that is gripping Iran has hurt ordinary Iranians and emboldened Rouhani’s critics to openly call for his ouster. In December Rouhani presented the $47.5 billion budget for 2019, which is less than half of the previous year mainly due to the severe depreciation of the local currency following US President Donald Trump’s decision to withdraw from the 2015 nuclear deal and restore US economic sanctions. Rouhani’s four-year term runs until 2021, but he has been facing calls to resign over his inability to rein in the rising cost of living and hyper-inflation causing anger among ordinary Iranians. .ברוך ה’ אלוהינו מלך העולם, דיין האמת. “We believe he prevented a greater terror attack from occurring,” Ettinger’s son-in-law Zeev Goldstein said. Iran expelled two Dutch diplomats in early March after the Netherlands accused Iran of involvement in assassinations in Holland. Holland also recalled its ambassador for consultations. Now Iranian media have pushed a complex conspiracy alleging that the Dutch diplomats were spies and that one of them is Jewish and connected to Israel. “We expelled two Dutch diplomats,” Iranian Foreign Minister Javad Zarif said on March 4, accusing Holland of an “illegal expulsion of Iranian diplomats.” Dutch Foreign Minister Stef Blok indicated that the intelligence service of Holland had pinpointed Iran as being responsible for political killings in the Netherlands. These allegedly involved murdered in 2015 and 2017 in Holland. Now Mashregh News and Tasnim News have both published articles accusing European countries of spying on Iran. “Spying at the highest level,” the article asserts. Tasnim then claims that the German ambassador to Iran, Michael Klor-Berchtold, is a member of the Intelligence Service of Germany, and accuses him of a relationship with Israel. “The German intelligence officer has been in charge of joint circles with the Zionist intelligence service.” The article then claims that there are more spies in the French, Australian and Danish embassies. The list goes on to name “agents” from these embassies. The article singles out French Ambassador Philippe Thiebaud and questions why a former ambassador to Pakistan and South Korea would be sent to Tehran. It claims that his role is related to knowledge of the nuclear weapons program of Pakistan and North Korea and therefore is focused on the Iranian nuclear program at the center of the current Iran-EU discussions aimed at preserving the JCPOA. The articles seem timed to coincide with tensions that Iran has had with Germany, Holland and France over accusations last year of Iranian involvement in attacks across Europe. In January a letter signed by the foreign ministries of the UK, Netherlands, Germany, France, Belgium and Denmark raised “serious concern” regarding Iran’s role in “hostile acts on EU territory.” It is unsurprising then that Iranian media would concoct a story about many of these same countries having “spies” in Iran. The articles may be intended to build pressure on Iranian leadership regarding these EU states. WASHINGTON — The United States strongly denied Sunday a report that it intended to leave almost 1,000 troops in Syria, adding plans for a residual force of around 200 troops had not changed. “A claim reported this evening by a major US newspaper that the US military is developing plans to keep nearly 1,000 US troops in Syria is factually incorrect,” General Joseph Dunford, chairman of the Joint Chiefs of Staff, said in a statement. Younger, more ruthless Palestinian terrorists first made their mark seven months ago with the murder in the Barkan industrial zone of Ziv Hajbi, 35, from Rishon LeZion and Kim Levengrund-Yehezkel, 28, from Rosh Ha’Ayrin. They have lost their fear of the IDF and go directly for Israeli soldiers and border guard police. Although army chiefs deny the influence of the “Eisenkot Effect” or “Elor Azaria syndrome” on the troops (the former prosecuted the latter for killing a prone Palestinian terrorist in Hebron), the fact remains that in the last three major terrorist attacks, the soldiers on the spot hesitated to shoot back. This is what happened on Dec. 9, 2018 when Palestinian gunmen in an attack at the Ofra junction took the life of an infant; in the Dec. 13, Givat Assaf attack, in which Palestinian gunmen shot dead two soldiers; and again, on Sunday, March 17, when two Palestinian killers stabbed then shot dead 1st Sgt. Gal Kaydan at the Ariel junction before snatching his M-16 and commandeering a passing car. They then continued their shooting spree at Giti Avishar junction and grievously injured two more Israelis. 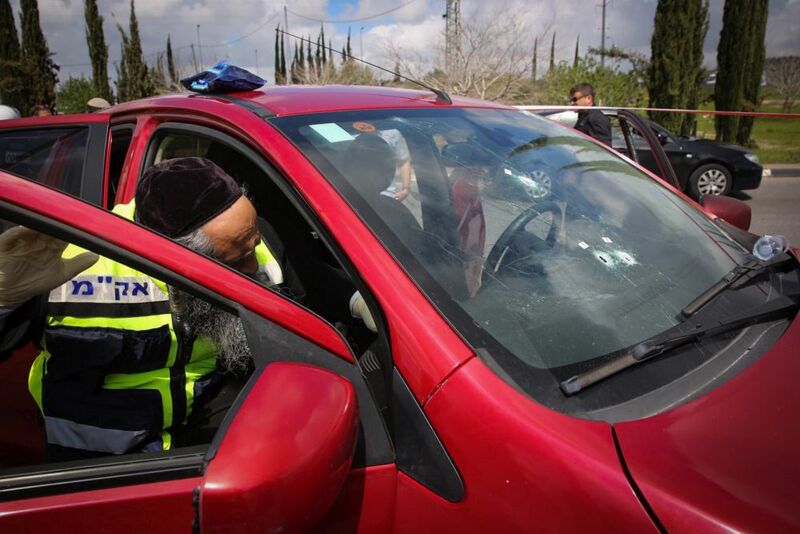 The terrorists take advantage of the highways of Judea and Samaria, which are open to the use of Israelis and Palestinians alike, for multiple attacks, moving easily from one scene to the next. Since last October, these killers have got away and stayed at large by studying IDF standard responses to an attack. While still on the run, these terrorists are free to prepare more attacks. They find encouragement from witnessing how during Hamas’ year-long cross-border campaign from the Gaza Strip, the IDF and Israel’s security chiefs were frozen in place for initiatives to cope with the menace, aside from predictable aerial bombardments. DEBKAfile’s military analysts conclude that the IDF, the Border Guard, the Shin Bet security service and their masters, by remaining trapped in outdated methods of operation and static responses, have left the arena of confrontation to the young Palestinians who are seizing the chance to make their mark. Prime Minister/Defense Minister Binyamin Netanyahu and the minister Yoav Galant, who often represents him, declared that the killers will be caught and brought to account. This tired old mantra offers no remedy. Even when they are eventually brought to book, more of the new Palestinian terrorists are still out there and confident they can outwit their old enemy. Just months after claiming the US would withdraw from Syria, Washington has now decided to keep up to 1,000 troops in the country. According to a new report by The Wall Street Journal. This is the latest shift in policy which has made the US appear disconnected from realities on the ground in Syria and unable to carve out a clear decision for what the future holds. In mid-December US President Donald Trump spoke with Turkish President Recep Tayyip Erdogan and decided to withdraw US forces from Syria. The US had up to 2,000 soldiers in Syria aiding the international Coalition to fight ISIS. The main US partners on the ground are the Syrian Democratic Forces. They had largely liberated eastern Syria from ISIS and surrounded ISIS in an area called Hajin by December. However Turkey views the SDF as linked to the Kurdistan Workers Party (PKK) and had threatened to invade an area in northern Syria held by the SDF. Trump appeared to side with Ankara in his December conversation and sudden decision to withdraw. The withdrawal changed many calculation in the region. The US had said it would remain in Syria until Iran left the country and it appeared the US would therefore be in eastern Syria for the long term. Trump’s reversal set in motion the resignation of his Secretary of Defense James Mattis and anti-ISIS envoy Brett McGurk. But others decided that they could change Trump’s mind. US Senator Lindsey Graham, keenly engaged in the Syrian conflict for years, visited Trump in late December and said he was hopeful that the Syria decision would be slowed down and not lead to chaos. Meanwhile Trump had visited US troops in Iraq and appeared to stay on track for the withdrawal. The SDF, fearing a Turkish attack, considered inviting the Syrian regime into eastern Syria. They also sent an envoy to Washington to drum up support. US Secretary of State Mike Pompeo assured the SDF and Kurdish fighters in Syria that they would not be abandoned in January. 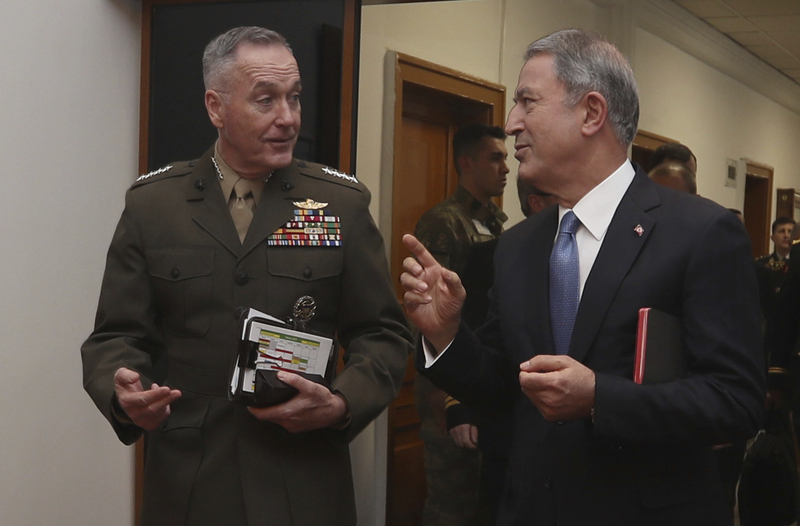 US policy began to shift, from promises to Turkey that the US would leave in early January, to deciding the US would work to prevent a Turkish operation. Instead what the US wanted was to leave by April and leave in place a “safe zone” along the Turkish border. But who would be in the safe zone? Turkey wanted its forces. The US wanted the European members of the anti-ISIS Coalition to send troops. In February the US hosted the Coalition in Washington on February 6, then the US sent envoys to a NATO event and held a summit in Warsaw to discuss Iran. On February 15 Senator Graham spoke at the Munich Security Conference and said the US wanted European countries to make up for the US withdrawal in Syria. By this time the US was indicating that around 400 troops might stay, and therefore Europe should send 1,600 or so. US allies were non-plussed and no one said they would send more troops. While Trump had announced the defeat of ISIS several times, most recently on February 28, the battle against ISIS in Syria is continued. Around 60,000 ISIS members have surrendered including more than 5,000 male fighters from 41 countries. Around 1,000 European ISIS fighters have surrendered in Syria, presenting a huge security challenge. And there are ISIS sleeper cells and an estimated 10,000 ISIS fighters who have melted back into local communities in Iraq and Syria, according to US intelligence estimates. The Wall Street Journal now reports that up to 1,000 troops will remain to keep the lid on the ISIS sleeper cells and stabilize eastern Syria. The US has figured out the safe zone issue with Turkey. The US will continue to train local security forces in eastern Syria, of which it wants 40,000 trained and has only trained up to thirty percent of those so far. It’s clear now that the administration continues to see Iranian influence in Syria as a threat, and that it understood that a few hundred soldiers wasn’t enough. The theory was that special forces units and intelligence units would remain bolstered by Coalition partners. But it appears the US cannot find European or other allies to boost their presence. The US also wanted funding to the tune of billions for eastern Syria. It isn’t clear if it has got that. In addition Iraqi lawmakers are trying to expel US forces from Iraq, which means the US may need eastern Syria more than it previously did. In December Trump had said the US would leave Syria and “watch” Iran and ISIS from Iraq. But Iraq doesn’t seem to want that. It remains to be seen if this is merely the latest change in US policy, or if Washington has finally settled on a Syria course.